My surface mount toner transfer experiments led me to move from using magazine pages to heavier photo paper stock to get better results. Take a look! 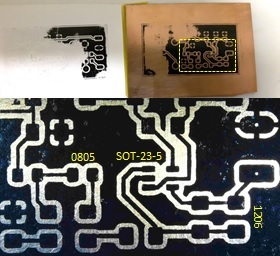 Up until now, I have had reasonable success using the toner transfer method to make PCB for through-hole components. Will the same approach work for tiny surface mount components? Time to find out. Typically, I have used glossy magazine pages to transfer the toner onto the copper board. In particular, pages from The Economist have worked well. Normally, after ironing on the patterns and soaking in warm water for 10-15 minutes enabled me to easily rub off the paper. But I found with the tiny tracks and pads needed for SMD, rubbing off the paper (by thumb or toothbrush) frequently damaged the fine tracks as the paper did not want to come off without taking some of the pattern with it. After six failures, I thought it was time to try something different. Aside number one: a wise man once said that doing the same thing over and over and expecting a different outcome was the definition of insanity. So true. Aside number two: thank goodness for acetone. If your toner transfer fails, you can just use acetone to clean the copper board (remove the toner) and start over. So, my final experiment was to shift from glossy magazine paper to inkjet photo paper. I stole a sheet from my wife’s photo printer and gave it a go. The photo paper is much thicker and heavier, and very glossy. With this heavier stock, I did not need to soak the paper in water. I just needed to carefully pull it back after ironing. Mixed results. On the downside, as I pulled back the photo paper I lifted off the toner on one side (see left, above). I need to do a better job of pressing and ironing. On the up side, the part that did work was great! In the lower half of the picture, you can see excellent surface mount toner transfer. The pads are perfect for 1206 and 0805 discrete components, and for the SOT-23-5 op amp. My new Andonstar ADSM201 digital microscope provided excellent magnification for checking my work. So, now I have satisfied myself that I can do the artwork and toner transfer DIY. Next is to find out if I can actually etch the board.